Swimming pools add luxury and value to any lifestyle — and vinyl-liner pools have risen to today’s design challenges and offer a smarter building solution. The advantages of vinyl-liners include flexible and durable material, long-lasting quality, easy installation, and a wide variety of colors and patterns to acheive a custom look. Vinyl pools have evolved significantly over the past few decades. When I started in the vinyl pool business back in 1972, you could have any shape pool you wanted (as long as it was rectangle) and you could have any type of liner you wanted (as long as it was aqua), leaving little room for creativity. Now, there are near limitless options in shape and color with vinyl pools, making it a smarter product that is more forgiving and updatable to match any homeowner’s tastes. I’m an advocate of quality pools — no matter their material — but I believe vinyl is a better way to build. With structural resin walls and solid I-braces, the pool’s footing totally supports the surrounding deck. When you look at gorgeous pools, what catches your eye is the surrounding decking, landscaping and water features that make you say, “I want to be there” — and that needs to be properly supported. You don’t want your pool to look beautiful for a year; you want integrity in your pool system because you’re building for the long-term. When we walk away from a project, I know for a fact that our pool will last. Durability is perhaps the best feature of vinyl-liner pools. Concrete and gunite pools, while wonderful structures, are climate-specific. As a builder in upstate New York, with its severe weather, we build about 300 custom pools a year — all vinyl-lined — and they’re very forgiving in harsh climates. We build our pools with concrete-braced polycarbonate and Graphex walls, solid concrete structural bottoms and vinyl membrane liners. With proper care, a liner will last anywhere between 15 – 20 years. In fact, liners are most often replaced for aesthetic reasons; our clients want to “re-wallpaper” their pool, as they would with their dining room! The abundance of vinyl-liner pool design options has made these poolscaping updates possible. Liners come in a spectrum of colors and an array of patterns. If someone wants a tile effect, we offer a product that allows for custom tile along the waterline and the liner installed underwater. With the advent of pool automation, owners can call from their cell phone and check spa temperature, turn on the heater, or perform any number of other operations. And with vinyl, you can enjoy features such as waterfalls, grottos, fiber-optic lighting, underwater speakers, rock slides, diving rocks and raised beams to give pools a totally unique and customized look. We even install radiant heating in our pool floors, which offers more energy-efficient heating with less water turbulence than that of traditional heating systems. Best of all, vinyl-liners have a user-friendly attitude: Their smooth surface prevents dirt and algae buildup, making maintenance a breeze, and if you brush your feet or knuckles on it, you barely notice it. No painful scrapes here! Aside from features, where do vinyl-liner pools fall into the luxury market? The number-one quality that makes vinyl popular among custom builders like myself is its ease of installation. Vinyl liner installation is very predictable in nature; we can tell exactly when construction will start and finish. Unfortunately, you can’t do that with many other materials because weather can hinder traditional construction timing and methods – whereas we can install the liner amid a driving rainstorm if we have to, and finish an award-winning pool under inclement weather and construction constraints. There are no limitations in pool size, on the location or the installation environment. Vinyl offers a very forgiving structure, while maintaining a high level of quality. And vinyl’s quality has been validated by the pool industry — two years ago, we submitted a gorgeous negative-edge pool that won a national first-place award out of several thousand entries. In fact, seven of the 10 awards given out that year went to vinyl-liner pools. No straight lines, all freeform – anything the customers can “imagineer” in their own minds, we can build it, as long as it meets safety specifications. People who can afford luxury pools have common sense, and they can know a quality product by looking at it. We have people walk into our showrooms and, literally standing a few feet from the pool and ask, “Is that gunite? Is that a ceramic tiled pool?” That’s a beautiful thing – and it speaks to the quality of vinyl-liner pools. With the help of vinyl, we’re able to create a beautiful pool environment, something that gives customers exceptional quality and enjoyment. Vinyl-liner pools are a user-friendly investment, creating a beautiful and relaxing escape for busy people — right in their own backyards. 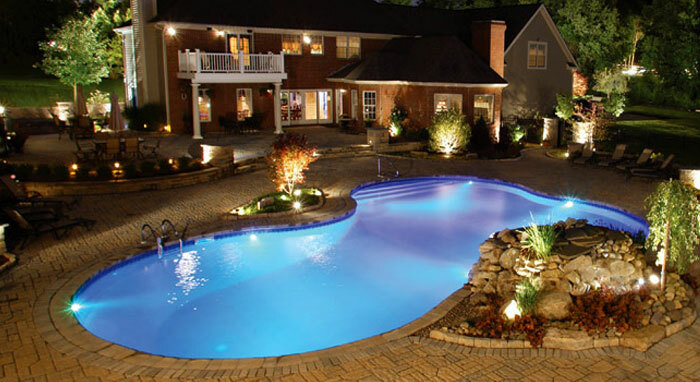 Michael Giovanone, owner of Concord Pools and Spas in Latham, NY, has been a custom pool builder since 1972. He chairs the Pacific Showcase Pool Builders’ National Advisory Board and is a member of the Aqua 100 Hall of Fame. A multiple recipient of Pool & Spa News’ Master of Design Award, his company has been named by the publication as one of the Top 50 Pool Builders in America. More recently, Michael was inducted into the Pacific Pools Hall of Fame, presented with the Presidents Lifetime Achievement Award by Latham International and was honored as the National Dealer of the Year by Pool and Spa News, along with the first-place Vinyl Liner Pool Design Award from the Association of Pool and Spa Professionals (APSP) and Aqua magazine.